William Tom, Cornish Settlement, Esquire. Richard Lane, Cornish Settlement, farmer. Edward Nicholls, of Sydney, but previously of Orange, storekeeper. Thomas Geake Lane, tallow chandler, Orange. This is the earliest indication of Cornish involvement in the copper mining of the Cadiangullong Valley, though the Cornish were to have a much greater influence and involvement in the mines at Cadia itself. 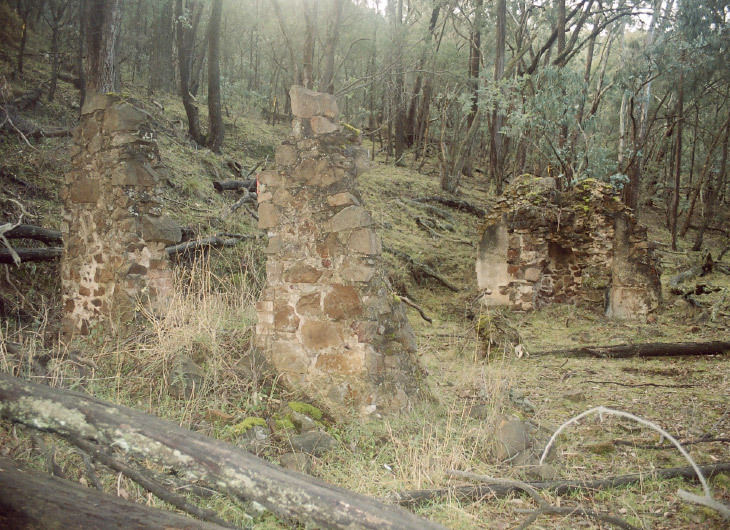 From 1829 William Tom and his family played a major role in the establishment of Byng, also known as the Cornish Settlement, near Bathurst. He was intimately involved in the discovery of payable gold in New South Wales in 1851, although the credit was taken by Edward Hargraves. The Canoblas Mining Company ceased operations between December 1861 and 1865. The workings at East Cadia could date from 1855, when the land was purchased by the investors. But none of these enterprises were to compare with the extent of work undertaken by the Scottish Australian Mining Company in the 1860s. 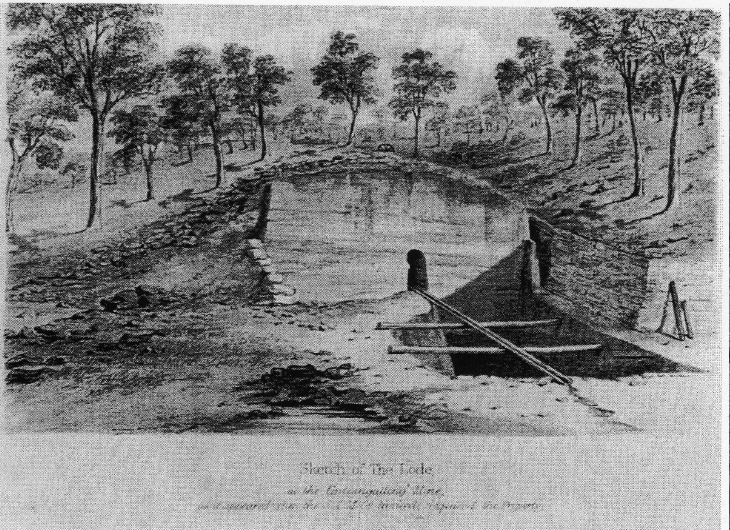 Sketch of the lode at the Cadiangullong Mine (East Cadia) as it appeared when the Scottish Australian Mining Company Limited acquired the property in 1861 (French Collection). 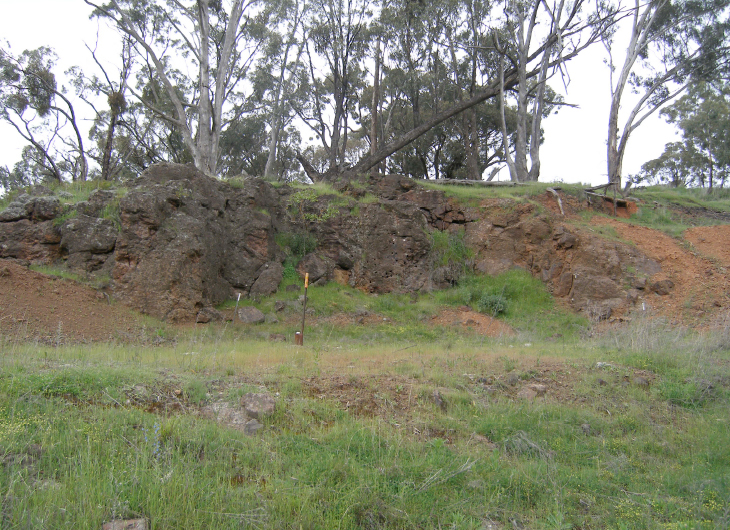 The rock face of the East Cadia or Cadiangullong Mine is still visible today, drilled with holes for blasting. The view is remarkably similar to the sketch of 1861 (Edward Higginbotham. 2005). The stone end walls of a building at Little Cadia Copper Mine suggested either a miner’s cottage or an assay office. The interpretation of the remains was confirmed by archaeological excavation in 2004 (Edward Higginbotham, 2004).